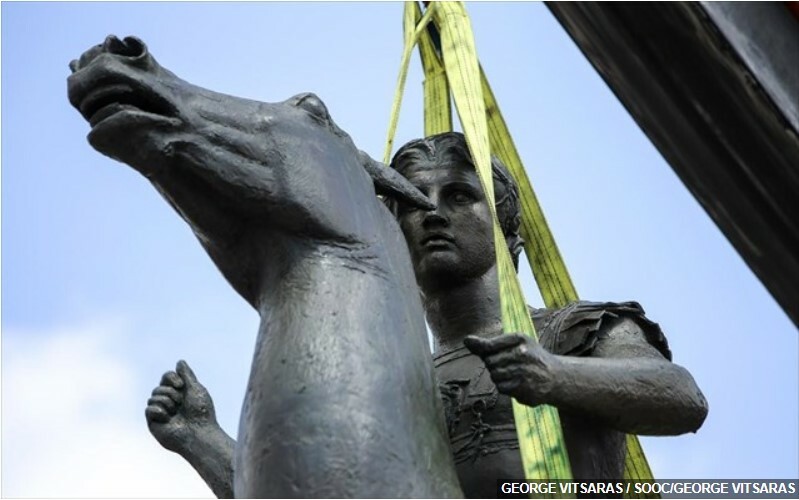 History Of Macedonia – Are the modern SlavicMacedonians descended from the Greeks and Alexander the Great? This article analyzes the intense political and cultural conflict between modern Macedonian Slavs and Greeks over the ethnic origin of the Macedonian people, especially whether or not they descend from ancient Macedon and Alexander the Great. The inter-cultural debate over their history is so intense that Macedonia was actually de facto embargoed by Greece for more than a decade because of its choice to use the name “Macedonia” (which Greeks demand may only refer to Alexander’s ancient Greek Macedon). Debates on Youtube videos are used to illustrate the puissance of this inter-cultural conflict. It is interesting to any reader because it shows how cultures use nationalism and history to create (falsely or not) an identity for their proud people. Brief history and culture of the ancient Macedonians, Greeks or Slavs? 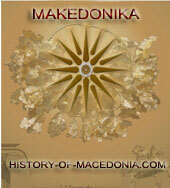 “Macedonia” and the “Macedonians” have a complicated history. Originally, Macedonia (or Macedon) referred to an ancient despotate in the period of a plethora of ancient Greek tribes and city-states in the 5th century BCE. As the Greek cities of Athens, Sparta, and Thebes collapsed into obsolescence and instability, the great military champion Philip and his son Alexander the Great exploited the equestrian prowess and military efficiency of the Macedonian Greek kingdom to conquer a realm that included all of the Greek tribes, Asia Minor, Egypt, Iran, western Central Asian, and Pakistan, forever reforming the cultural and political framework of Eurasia for the next several centuries. After Alexander’s death, his ephemeral empire collapsed almost immediately, divided among Greek tribes and warlords like the Seleucids and Ptolemaic dynasty. What is now Greece was divided between a number of petty ethnic Greek states prior to the transcendence of Rome, including Macedonia, Sparta, Aetolia, Achaea, Rhodes, Pergamon, and Epirus (see the map below). The largest of these Greek states in the 3rd century BCE was Macedonia, then firmly an ethnically, culturally, and linguistically Greek nation that was in great contrast to the Slavic Macedonia of today. Historical evidence indisputably dictates that the ancient Macedonians expressed a Greek language and culture. However, Macedonian society had a number of minute distinctions from the rest of the peninsula, including a great emphasis on horses and a great proximity to encroaching barbarians, that has led many to postulate that the Macedonians were of non-Greek racial origin that adopted a uniformly Greek culture. This is a basis of many modern Macedonians’ argument that they and the ancient Macedonians were non-Greek. During the late 3rd century, as the insignificant Roman Republic progressed into a massive imperial presence that briefly crushed the Carthaginians during the Punic Wars, the Greek tribes and states of modern Greece became a target. Philip V of Macedonia (named after Alexander’s father), an ally of Carthage, became an opponent of Rome. Four subsequent Macedonian Wars between Greek Macedonia and Rome resulted in the complete annexation of the peninsula and all of the Greek tribes by the Romans by the middle 2nd century BCE. The complete historical, cultural, ethno-racial, and linguistic roots of the region are entirely Greek from the foundation of Macedon as a signficant power in the 5th century until its collapse in the 2nd century before Christ. The Greeks extoll the world-conquering and culture-creating achievements of Alexander the Great, Philip, and Philip V as proof of the glory of a Greek Macedonia. Macedonian nationalists who claim an Alexandrian inheritance insist that Alexander and the ancient Macedonians were of a distinct genetic stock to the Greeks, despite having a Greek culture. From the 6th century onward, migrating Slavs populated and settled in the Balkans, becoming the main ethnic, cultural, racial, and genetic stock in Macedonia, Serbia, Bulgaria, Bosnia, etc. The Macedonians have since inherited a Slavic culture, language, heritage, religion (Orthodoxy), and identity. This 1,400-year Slavic history is the basis for the claim to a Slavic Macedonia that rivals the Greeks’ claim to an ancient Greek Macedon. The identity of the modern nation of the Former Yugoslav Republic of Macedonia emerged in the early 20th century as the yoke of Ottoman Muslim conquest began to atrophy into total collapse. In the vacuum of independence movements that followed, the Slavs of the territory of Macedonia struggled to build a free nation. Macedonia, an abstract geographic term referring to the whole multi-ethnic region straddling Greece, Bulgaria, and Serbia, was the last territory to be liberated from foreign Muslim occupation. Undeveloped nationalist movements emerged that promoted an eclectic array of ethnic affiliations, some Slavic like the Bulgarians and Serbs, some independently Macedonian, and some Greek irridentists who sought to merge with the new nation of Greece. All were closely aligned with the Orthodox Christian faith. This independence-aspiring movement, greatly supported by the Orthodox Slavic nations surrounding it, focused more on their desire to be liberated from Muslim occupation than on any Greek, Slavic, or other racial affiliations. The genesis of a Macedonian national identity was a national uprising against the Turks in 1903 that established the so-called Krushevo Republic that was eventually crushed. This complicated history is important in order to understand the many ethnic groups’ claims to Macedonian heritage. In 1913 in the Balkan Wars, an alliance of all of the Balkan Slavic states and Greece decimated the Ottoman Empire and liberated Macedonia, which was annexed to Slavic Serbia much to the disappointment of ultra-nationalist Slavic Bulgaria. The subsequent Second Balkan War of Serbia against Bulgaria over Macedonia led to the crushing defeat of Bulgaria, and placed Macedonia firmly in the hands of Serbia. As Serbia expanded after World War I to incorporate what became Yugoslavia, Macedonia became an integral territory of Yugoslavia for nearly a century to follow. During World War II, when Axis Bulgaria was allied with Adolf Hitler, Macedonia was annexed by Bulgaria. An intense effort by the Bulgarian government to purge Macedonia of Serbian, Jewish, Gypsy, and other non-Bulgarian traits illuminates the still-surviving Bulgarian claim to Macedonian identity. After Bulgaria’s defeat by the Soviets, Macedonia returned to now-Communist Yugoslavia from 1945 until 1992. In 1992, as the Yugoslav Wars tore the nation apart, the Macedonians declared independence peacefully. Macedonia is today one of the poorest and most obsolescent nations of Europe, and has been frequently troubled by an ethnic Albanian Muslim minority (33%), especially during the 2001 civil war that they caused. As seen in the above historical walkthrough, the ethnic and cultural identity of “Macedonia” has long been blurred and disputed between different neighboring identities. Bulgarians insist that today’s Slavic Macedonians are merely Bulgarians who effectively renamed their language to “Macedonian” during Yugoslav rule. Serbs insist, due to their inclusion in Yugoslavia on and off from 1918 until 1992, that the Macedonians are Slavs closer to the Serbs. Albanians insist that the region of modern Macedonia belongs to the Albanian minority and once belonged to (falsely) ancient Illyria, which Albanians claim to be their ancestral homeland. Each of these cultures bitterly hates each other. 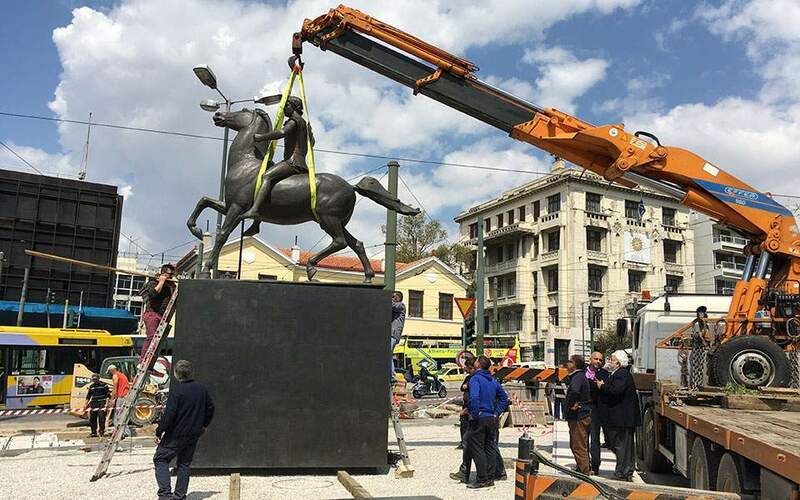 Greeks insist that today’s “Macedonians” are merely Slavs who have no right to trace their ancestry to their resplendent Greek despot Alexander the Great, a lion of Greek cultural heritage. The Macedonians, however, having separated from their hated previous Serbian rulers of Yugoslavia, fail to agree on their interpretation of their ethnic heritage. Many Macedonian nationalists claim to be the direct descendents of the ancient Greek Macedonians, including Philip and Alexander the Great. Others claim that the Macedonians are a mixed population. Others say that they are a firmly Slavic people like the rest of their neighbors. Others acknowledge that their language (a cornerstone of their nationality) is virtually identical to Bulgarian, and thus they are more Bulgarian Slavic than they are ancient Macedonian, Greek or otherwise. The inter-ethnic conflict in Europe is so strong that it has caused Greece and Macedonia to almost approach war. From its independence in 1992 and its choice of the name “Republic of Macedonia,” Greece initially refused to recognize the nation’s existence altogether. 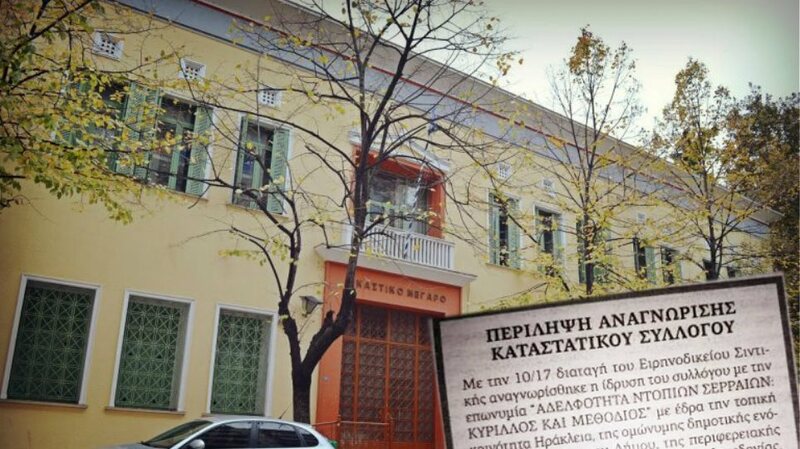 Greeks bitterly refused to allow what they viewed as the non-Greek Slavs to lay claim to this ancient Greek Alexandrian heritage. Bulgarians dismissed the Macedonian claims of a different, non-Bulgarian identity. Even the geography of Macedonia is a problem, given that only a tiny portion of the modern nation of Macedonia corresponds with ancient Greek Macedon. The Greeks actually imposed a de facto trade embargo on Macedonia for nearly a decade due to this inter-cultural traducing. Although Greek and Macedonian politicians are more pragmatic and have set aside this conflict in the name of auspicious economics, citizens from both cultures actively oppose each other. Even today, ethnic Greeks and Macedonians are bitterly racist against one another. Finally, the official name “Former Yugoslav Republic of Macedonia” was selected to emphasize that modern Macedonia is not the same as ancient Macedonia, but rather an offshoot of Slavic Yugoslav history. This was a practical effort by the bankrupt nation of Macedonia, almost the poorest in Europe, to attain good standing with their neighboring and very wealthy trading partner Greece. Whenever the prefix “FYRO” is not included, intense arguments always follow that have even required international diplomacy summits in Bucharest as recently as 2008. Many criticize that the Macedonian flag’s sun is an obvious replication of ancient Macedon’s sun standard. After 1995, the original flag of FYRO Macedonia was changed from the nearly exact same flag as Philip’s to its modern format seen below. Most Macedonians today are split between the assertion that they are Slavs or ancient Macedonian descendents of Alexander. Many argue whether Alexander was Greek or “Macedonian,” whilst Greeks refuse to see any distinction between the two affiliations. The official government position, seeking peace with wealthier Greece, acknowledges that the Macedonians are not Greek, but Slavic. The first president of Macedonia (Kiro Gligorov), under whose authority the naming conflict arose, admitted “we are Slavs who came to this area in the 6th century…we are not descendants of the ancient Macedonians [Greeks].”  Slavs have occupied Macedonia for 1,500 years along with the rest of the Balkans, giving it their physiognomy, culture, genetics, and language that are all firmly distinct from the features of the Greek race. The Macedonian people, however, are of varying opinions. Aside from its Alexandrian flag, many expressions of Macedonian society intimate a perceived connection to the ancient Macedonians or Greeks. Macedonia’s capital airport in Skopje is called Alexander the Great airport. 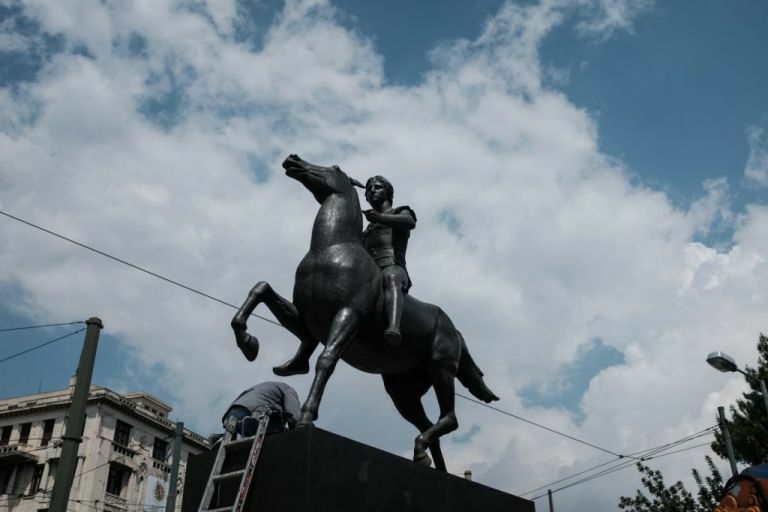 Statues of Alexander can be seen throughout Macedonia. Museums in Skopje extoll the Alexandrian heritage of their nation. Although Macedonians proudly identified themselves as Slavs from 1914 until 1992, many Macedonians were inclined to distance themselves from their hated Serbian Slavic rivals, and as a result many readily created a new myth of this semi-divine ancestry that made them separate from all of their foreign claimants. At least six Macedonians I interviewed in diaspora emphasized their unique roots not as Slavs, not as Greeks, but as Macedonians. Many repeated that soon archeology will “find evidence any day now” proving that the modern Macedonians are related to Alexander the Great and that the Greeks are not. Many websites, blogs, articles, and online debates tackle this controversial issue. HistoryofMacedonia.org is a salient example. Some emphasize that they are related to the ancient Greeks, and others the Slavs. Many websites and videos are entirely devoted to traducing the Macedonians as lying, slanderous Slavs who stole the ancient heritage of the Greeks to empower their poor and backward nation. Below is a selection of Youtube videos showing these intense arguments. Please view the violently aggressive comments on Youtube to better understand this conflict. 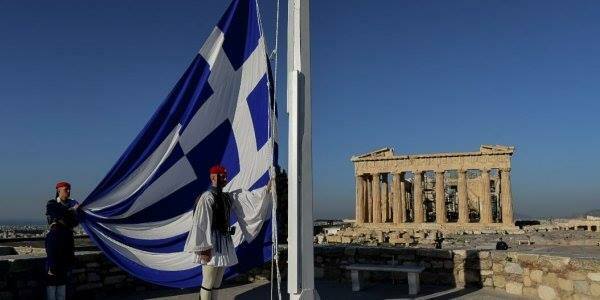 Origin of the FYRO”Macedonians” — You must see this video! Which is the origin of FYROM ‘s inhabitans? you must see it!